This blog post is a continuation of the previous two posts. The first post provided an overview and introduction to the concept of motivation from a behaviorist’s perspective; the second went more in-depth about those things that trigger or cue our behavior, antecedents and motivating operations. Recall that, in common sense terms, behavior occurs as a function of knowledge and motivation; a person must not only “know how” to do something but also “want to” do it. One of the first steps in assessing someone else’s (or our own) behavior is to make sure that we’ve ruled out issues related to the “know how”—namely, that we’ve ensured the individual has the necessary resources (e.g., equipment, technology, materials) and is capable of performing the behavior of interest (i.e., knowledge, skills, and abilities). We make sure to rule out any medical, mental/psychological, and physical limitations. If the behavior isn’t occurring after the “know how” is accounted for, then we need to take a look at potential motivating operations (since MOs can change the effectiveness of consequences), as well as the consequences themselves. Consequences happen as a result of behavior and occur during or after the behavior. Consequences influence the probability that a particular behavior will recur in the future under similar circumstances. EVERY behavior has a consequence. Positive reinforcement (R+): occurs when we get something we value or want (i.e., positive reinforcer) and, as a result, the future probability of behavior increases. Negative reinforcement (R-): occurs when we avoid or escape something we don’t want (i.e., negative reinforcer) and, as a result, the future probability of behavior increases. What is sometimes confusing is that, just like the effectiveness of a single consequence can change over time or under certain conditions (e.g., MOs), the same consequence can also affect the same behavior of two different people differently. This is because each of us has a unique learning history, full of different life experiences. Thus, the same consequence stimulus or event can be reinforcing or punishing for different people. For example, some people seek attention or pain, while others avoid attention or pain.As a side note, the terms “positive” and “negative” should not be interpreted as “good” or “bad”. These terms refer to what is occurring in the environment; a stimulus is being added (positive) or taken away (negative). For purposes of the remainder of this blog post, I’m going to focus on the consequences that increase or maintain our behavior (i.e., positive and negative reinforcers) to illustrate their role in influencing healthy and unhealthy behaviors. Positive and negative reinforcers can be classified as natural or programmed. A natural reinforcer is one that is available to us via our interactions with the environment. These reinforcers typically do not involve interactions with other people. For example, when you pull the handle on the refrigerator door, the door opens (and because it opens, you’ll pull on the door handle again in the future). Other examples include smoking when the natural consequence is a reduction in stress or eating when you experience an increase in energy. Natural reinforcers might also be referred to as “automatic” or “intrinsic” reinforcers because they are “not mediated by the deliberate action of another” (Vaughan & Michael, 1982, p. 219). Behavior that is naturally reinforced increases or is maintained because the behavior or activity, itself, is reinforcing / fun to do, or it produces positive or practical outcomes. For many who maintain a regular exercise routine, physical activity itself might become naturally reinforcing if the individual experiences it’s psychological (e.g., stress reduction, emotional balance) and/or physical (e.g., improved health, aesthetics) benefits. Programmed reinforcers, on the other hand, are typically dependent on and involve interaction (direct or indirect) with another individual. These reinforcers might be social (e.g., verbal praise, thank-you notes, a pat on the back, positive feedback) or tangible (e.g., food, gift certificates, prizes, money) in nature. Thus, “intrinsically controlled behavior is behavior maintained by consequences that are the natural and automatic results of responding. Extrinsically controlled behavior is behavior controlled by stimuli external to the task.” (Dickinson, 1989, p. 2). The discussion of consequences inevitably sparks comments and questions related to the differences between “intrinsic” and “extrinsic” reinforcers/rewards and whether one is inherently better than the other. While I won’t get into the details of the arguments for and against, I have listed some great articles and resources at the end of this post for your reading pleasure. I will also say that I believe BOTH natural/intrinsic and programmed/extrinsic reinforcers are important when learning and establishing NEW behavioral patterns or routines. Since the consequences of our behavior determine whether we will continue to engage in a given behavior, and the goal is to set up the environment to support desired health-related behaviors. In last week’s blog, I provided some ideas for ways to cue healthy behavior. Unfortunately, some of the natural consequences associated with healthy lifestyle behaviors are initially punishing because they result in negative and/or uncomfortable outcomes (e.g., sore muscles after exercising, increased time spent meal planning, cravings, feeling unsure). Sometimes, these consequences can be more powerful than the delayed (and sometimes uncertain) positive natural consequences (e.g., improved health, increased strength, decreased digestive discomfort, feeling confident and empowered). This highlights another complexity when it comes to consequences—multiple consequences can occur simultaneously for the same behavior, and the effectiveness of each consequence is dependent on whether the consequence is positive or negative, immediate or delayed, and certain or uncertain. Regardless of whether the consequence is positive or negative (from the perspective of the individual who is behaving), it will be more powerful/effective if it is immediate and certain. Therefore, if you are guaranteed to always have a lot of pain/discomfort after engaging in a specific activity (e.g., running barefoot on hot coals), you are more likely to avoid that activity. Likewise, if you are guaranteed to feel immediate positive feelings/emotions while engaging in an activity (e.g., watching your favorite romantic comedy), you are more likely to want to do that activity. Since the early stages of developing new habits and routines, especially in relation to health-related behavior, can be difficult from a psychological perspective due to feelings of uncertainty, discomfort, urges, or negative self-talk, I believe most people can benefit greatly from learning and building skills that improve psychological flexibility. I have personally observed the benefits of applying mindfulness and self-awareness techniques (e.g., meditation, breathing exercises, intentional ‘pauses’) to my own behavior and to that of my client such that I and they have had an improved ability to continue to move in the direction of what matters even in the face of difficult inner experiences. In this case, the new pair of walking shoes would be a delayed, positive reinforcer that you would receive upon meeting your goal. As a note of caution, self-reinforcement and self-administration of consequences is a complex process. You will need to remind yourself of long-term goals and of the rules you’ve set in order to get there. This is why many people will choose to make their goals public and ask for support from others along the way. Social attention can be a very effective positive reinforcer for desired behaviors, though it’s important to remember that social attention may not be a positive reinforcer for everyone! 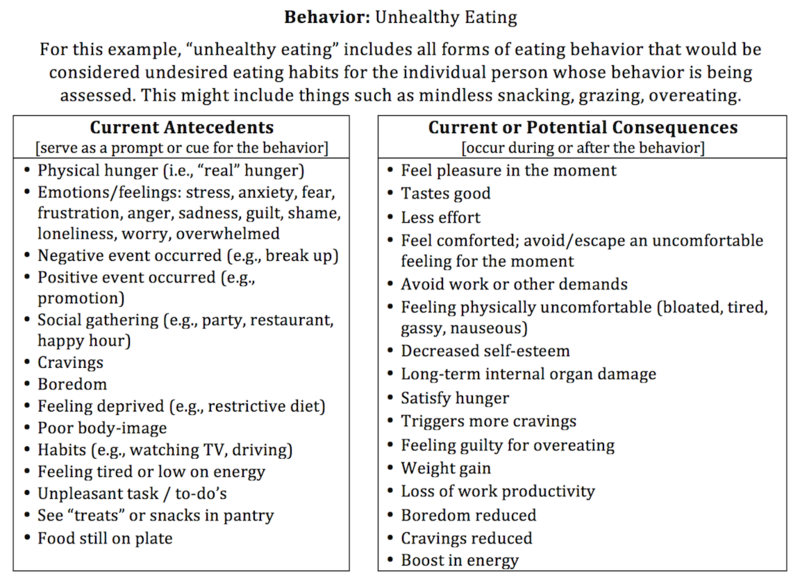 Now, if we look back at the list of consequences for unhealthy or non-hungry eating behavior, we see several natural, positive reinforcers: feeling pleasure in the moment, feeling comfort, feeling less bored, feeling nurtured, avoiding doing something, etc. In this case, our goal is to replace the unhealthy or non-hungry eating behavior with a healthier behavior that doesn’t involve food and, at the same time, allows us to obtain those SAME/SIMILAR positive consequences to satisfy our needs for things such as nurture, energy, stress management, and self-care. If we increase our self-awareness to become “master noticers”, we can better recognize our behavioral patterns and routines, including those things that are cues/triggers (antecedents) and reinforcers/rewards (consequences) for our behavior. If the behavior continues to occur, it IS being reinforced. Either we getting something we want (positive reinforcement), or we are avoiding/escaping something we don’t want (negative reinforcement). There is no right answer to that question; sometimes the answer will be “yes” and sometimes the answer will be “no”. If you take a moment or two to pause and connect with the present moment, YOU get to make an educated/conscious choice to do something different (e.g., a non-food related nurturing behavior) and move toward your goals or to engage in the old “default” routines and habits that, while they offer short-term relief, move you away from what is important to you. We can feel discomfort AND do what’s important to us. In order to say “yes” and to really mean it, however, we need to be willing to try something new and practice skills (e.g., mindfulness) that allow us to pause and make room for those negative inner experiences. Cameron, J., Banko, K. M., Pierce, W. D. (2001). Pervasive negative effects of rewards on intrinsic motivation: The myth continues. The Behavior Analyst, 24, 1-44. Dickinson, A. M. (1989). The detrimental effects of extrinsic reinforcement on “intrinsic motivation.” The Behavior Analyst, 12, 1-15. Martin, G. L., & Pear, J. J. (2015). Behavior modification: What is it and how to do it (10th ed.). Upper Saddle River, NJ: Pearson-Prentice Hall. Vaughan, M. E. & Michael, J. (1982). Automatic reinforcement: An important but ignored concept. Behaviorism, 10, 217-227. Are you are looking to develop your own coaching skills to improve client success? I’d love to discuss the opportunity work with you. Contact me today!